COEXIST Cigars For Sale. Cheap! Michael Brown’s strong arm robbery of cigars has led to hundreds of victims. These would include his parents, Officer Wilson and his family, the community of Ferguson including a young Christian woman who owned a store named Hidden Treasures (store demolished in flames by rioters) and the hundreds who have been injured physically, financially and emotionally. It takes a lawless child to raze a community. The Ferguson rioters and looters, BTW, are no different than the North Koreans when they threaten nuclear war to defend their human rights record. The distributive injustice of the rioters and looters is the flagrant opposite of true Social Justice: “Love your neighbor as your self.” More Scripture later. Black America as a whole is victim to a significant deficit of leadership from the WH and AG Holder. Black America is also being used by Al Shaprton, Jesse ‘PUSH” Jackson and the race industry, an ‘industry’ which strives to diminish knowledge about black neighborhood violence for the sake of the increased reimbursable victim ‘hood.’ Throw money at the problem. An indisputably good and prayerful Black American, Dr. Alveda King, who has spoken up so many times in public, would never tacitly encourage the barbarian acts of the rioters while the above mentioned culprits are in serious and silent denial. Several ‘eyewitnesses’ perjured themselves when they gave testimony to the grand jury, apparently so that the fires of outrage could “burn, baby, burn.” But self-immolation will never be the pathway to society’s success. Thank god we have a gigantic redistributive Progressive government that has created a booming economic milieu in Ferguson! Not! “Consume , baby, consume and at all costs” is a similar war cry but coming from Keynesian economists. But that is not going to happen in Ferguson for a long while. Oops! Another ‘fixit’ diversion is required! And here it comes! Of course, it does nothing for the Ferguson human crisis unless you are worried about the after-riot ozone levels. While tempers flare and torch the town of Ferguson even now Obama and Bureaucratic Czar #1, EPA Administrator Gina McCarthy, seek to control the Kulturesmog via new regulations. As I write this they are planning ways to burn billions of taxpayer dollars in their war against SMOG. They seek to save our lawless society from itself by snuffing out non-existent man-made global warming (GW)!! No doubt the next concocted report out of the UN regarding GW will presume that human anger is directly correlated to GW!! Michael Brown. We need a folk song to sing the praises of your cigar-stealing-pot-smoking-“f**k-the-man-“f**k you” ways. Al Sharpton, you can buy the rights to help finance the race industry’s fight with itself. 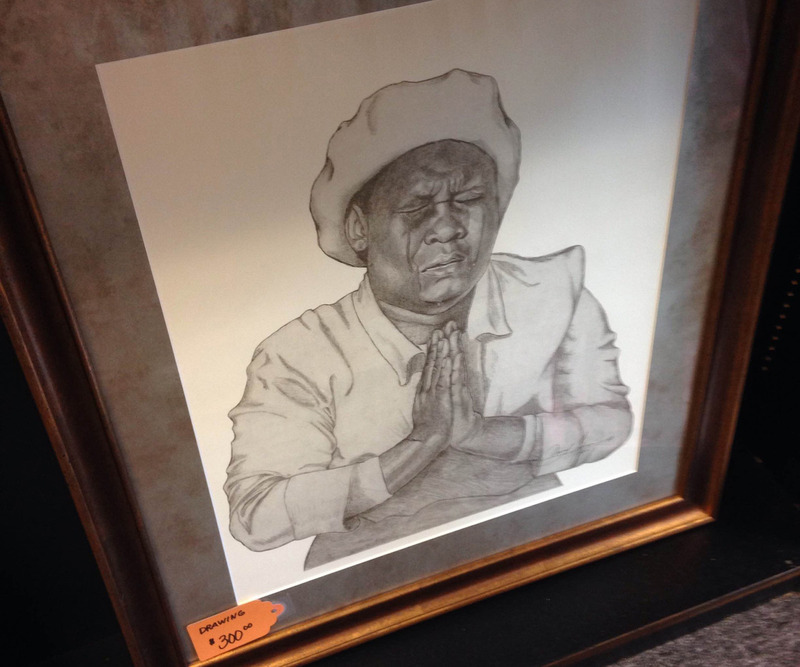 A painting that was for sale in Hidden Treasures, Andrews’s store, before it was burned on Nov. 24, 2014. Is this post too sardonic? Perhaps. But Americans need a cup of cold water splashed on their over heated zeitgeist. People in this country, people who ride the train to work with me seem to be clueless about the incident and the relevant evidence regarding the Michael Brown case. “About two weeks ago I was riding the Chicago Metra train to my downtown workplace. After a stop near the city several passengers boarded from what many consider an ‘uppity’ neighborhood near Chicago. Before we reach that stop I put my away my book, knowing that I will be standing in the train vestibule discussing whatever topic is broached among the three or four of us heading to Chicago. The ‘train’ guy appeared to be clueless about the facts. 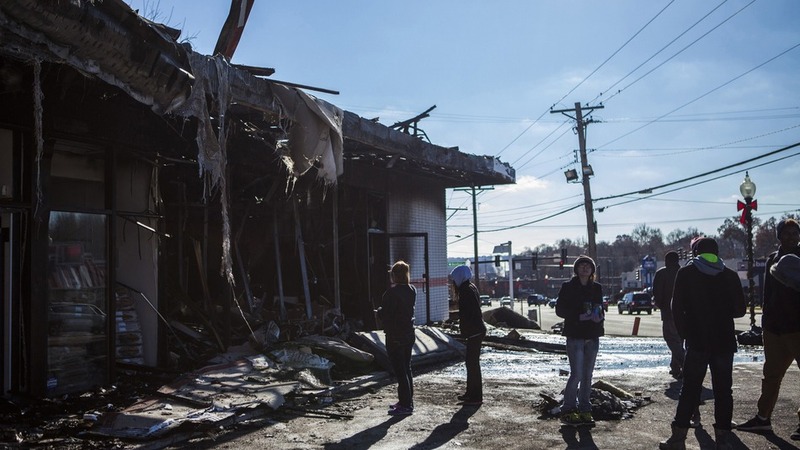 It was as if he believed and accepted the Ferguson lynch mob’s narrative carte blanche. Michael Brown apparently didn’t care about Officer Wilson or the law or his parents or care enough even to defend his own life from folly. And, sentimentality is no Savior. 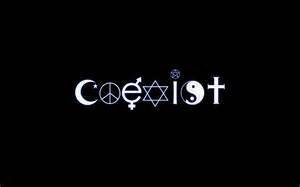 Sentimentality is a stolen Swisher Sweet wrapped in the Progressive’s “COEXIST” label-a slow burn. thank you for bringing attention to her story !!! has a gofundme account been set up for this the owner of hidden treasures ?